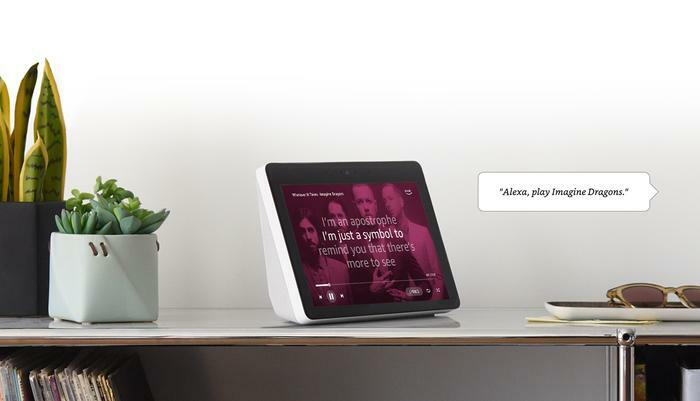 With the arrival of the Amazon Echo Show to Australian shores, it feels fair to say that the age of the mass market smart display has truly arrived. Whether or not they’ll prove as successful or popular or useful as their smart speaker counterparts feels like another question entirely. Still, if you’re already a convert to Amazon’s voice assistant ecosystem and looking for a way to take things further - the Amazon Echo Show offers exactly that. Where the alarm-clock form-factor of the Echo Spot failed to thrill, the Show offers a more complete vision of what a smart speaker can do when paired with its own display - even if it does feel like there’s still enough catches that it probably won’t be the right fit for everyone. When it comes to the design, the Echo Show plays things fairly straight. From the front, it’s a rectangular screen with puppy-fat bezels and a single front-facing camera. Flip things around, the speaker comes skinned in the choice material for most smart speaker hardware out there: mesh fabric. And when placed on a bench, table or shelf, the Echo Show fits in really well - though again - those bezels are really a little too blocky for my tastes. Maybe this year’s slew of thin-bezel flagship smartphones have distorted my expectations on this but it just seems like so much wasted space. Regardless, there are two major use-cases that Amazon have in mind here. 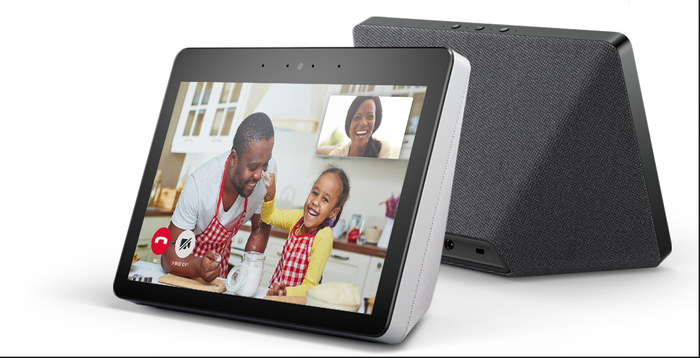 The first is that you can leave the Echo Show set up as a digital photo-frame (similar to the recent Google Home Hub) and smart home hub (via the same kind of built-in ZigBee connectivity found in the Echo Plus). The second is that you can use the Echo Show as a secondary display for watching video content through Amazon Prime Video while you do something else. As for the speakers on the Echo Show, they’re actually surprisingly decent. They lack the fidelity or volume found in other, more-dedicated smart speakers. However, to our ears, we’d easily say that the Show’s dual-speaker array sounds more than good enough compared to the other smart display options currently available. Unfortunately, we weren’t as thrilled by the screen itself. It’s a little large and while the resolution is fine, it’s little else. Safe to say it didn’t really dazzle us. It lacks the brightness of the Lenovo Smart Display or the crispiness of the Home Hub’s smaller 7-inch screen. These shortcomings slightly-undercut the Echo Show’s viewability at times, especially if we had it set up near a source of natural light like a window. Taken as a whole, the form-factor is a little bulkier than I’d like but the Echo Show still holds its own on an aesthetics level. It’s a product that puts its best foot forward, and even if you can’t help but notice the blemishes, it’s still pretty compelling in the right context. Performance - How Does The Echo Show Compare To The Competition? Honestly, whether or not you’ll like what the Amazon Echo Show has to offer it going to depend on your feelings towards Alexa as a smart assistant. If you prefer the way Google or Siri handle things, I can’t see the Show winning you over. However, if you’re already sold on Amazon’s AI, the Show does do a serviceable job of building on its existing strengths. To begin with, the Show supports doing pretty much everything any Alexa-powered speaker does. That means you can use it to play music, get news and sports updates, check the weather and remotely control your smart home devices. Then, like the Echo Spot, the Show will then try to enhance any responses by using the screen. This is all fairly intuitive. If you ask it for music, it’ll display album art or lyrics. If you ask it a question on a topic or ask it for news updates , it’ll sometimes display relevant imagery (pulled from Bing - not Google). If you’ve got any smart surveillance gear around you can even stream it straight to the Show’s display. 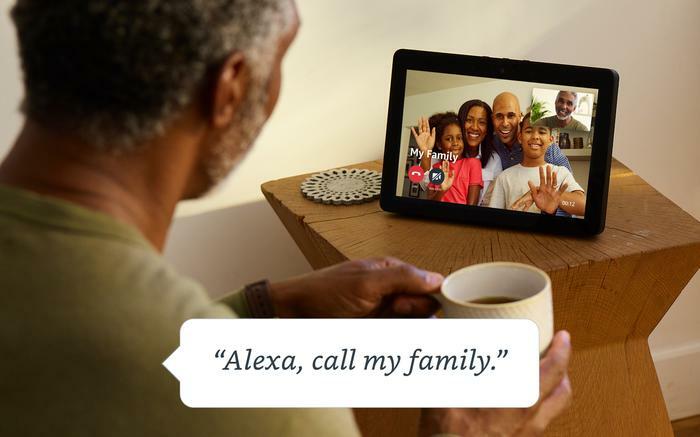 There’s also video calling, assuming the person you want to call has an Amazon Echo Show or Spot with which they can respond. Again, the actively-watching-video-content-while-doing-another-thing use-case has been placed front-and-center here. This seems like a savvy bet by Amazon, even if it ultimately falls short of what it could be. The Echo Show’s screen and speakers make it a great fit for watching video content, either found by searching via a Youtube (via a web browser) or on Amazon’s Prime Video streaming service. The latter is key here. It’s easy to envisage a scenario where being able to catch up on streaming content while cooking in the kitchen could be desirable - though the limitation of Prime Video content does limit the appeal somewhat. 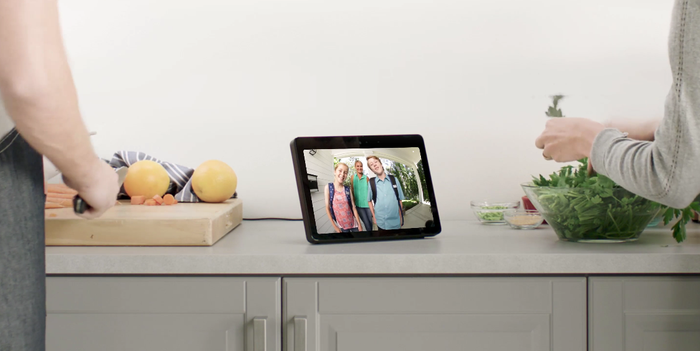 Where other options have gone in on video or sound, the Echo Show’s emphasis on video is likely going to be the dominant path forward for this corner of the smart home category. After all, all the Echo Show needs is a better and bigger screen and a larger library of content to draw from and you’ve basically got a next-generation smart TV. We’re not there yet - but it’s easy to see where this thing is going.